The skull belonged to the great Hunkpapa leader Sitting Bull. It was used in prayers, certain ceremonies, and was consulted prior to the Seventh Cavalry's arrival at the Little Big Horn Valley. 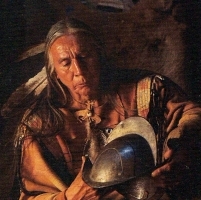 It had special meaning for Michael because many of the great Native American warriors whom he admired undoubtedly had contact with it... including Tasunka Witko - Crazy Horse. In 1986 Michael had the image of Sitting Bull's skull tattooed onto his chest so it could rest next to his heart. A few years later, as he lay on an operating table at UCLA, the surgeon looked down and remarked on the uniqueness of his tattoo. Before Michael passed out, he requested that the scalpel not cut into the precious image. Michael survived the surgery and so did the tattoo. The thrilling tale of a man, a horse and the search for peace amidst the horrors of the First World War. Stranded behind enemy lines, Ledyard Dixon must find his way to safety over the perilous expanses of no man's land. An abandoned cavalry horse he calls Drayton becomes Ledyard's comrade. Drawn together in a companionship stronger than any human bond, horse and rider fight for life, for love, and for a return to the kind of peace that only home can offer... but will they ever find their way home? Published in association with Hrymfaxe. 101 pages. 19 illustrations. 8 3/4" x 11 1/4"
Limited print of 1000 copies. Set in 1863, the novel follows Lieutenant John Dunbar on a magical journey from the ravages of the Civil War to the far reaches of the imperiled American frontier, a frontier he naively wants to see "before it is gone". His posting to a desolate and deserted outpost is the springboard for contact with the lords of the southern plains... the Comanche. Though he does not speak their language, has no know-ledge of their customs, and is considered a trespasser, Lieutenant Dunbar finds himself intrigued by the exotic and alien culture of the buffalo-hunting people of the plains. A simple desire to know more about his wild neighbors ignites a great adventure of transformation that culminates with the emergence of a different kind of man... a man called Dances With Wolves. Eleven years have passed since Lieutenant John Dunbar became the Comanche warrior Dances With Wolves and married Stands With A Fist, a white-born woman raised as a Comanche from early childhood. With their three children, they live peacefully in the village of Ten Bears. But there is unease in the air, caused by increased reports of violent confrontations with white soldiers, who want to drive the Comanche onto reservations. Disquiet turns to horror, and then to rage, when a band of white rangers descends on Ten Bear's village, slaughtering half its inhabitants and abducting Stands With A Fist and her infant daughter. The three surviving great warriors - Wind In His Hair, Kicking Bird, and Dances With Wolves - decide they must go to war with the white invaders. At the same time, Dances With Wolves realizes that only he can rescue his wife and child. Told with the same sweep, insight, and majesty that have made Dances With Wolves a worldwide phenomenon, The Holy Road is an epic story of courage and honor. In Marching To Valhalla, Michael Blake turns his storyteller's eye on George Armstrong Custer, West Pointer, youngest Union general of the Civil War, horseman, passionate lover, explorer, ardent husband, and, most famously, Indian hunter. In Blake's pages, Custer emerges as a dashing, driven soldier, suspicious of his friends, respectful of his enemies, and ever unable to feel quite alive in the civilian world. Composed in the form of Custer's journal, Marching To Valhalla is an impeccable merging of fact and fiction, a powerful evocation of our bloody past, and a tribute to the endurance of a human heart facing adversity and disaster. A masterpiece of Michael Blake's novel is a tragic romance that reveals a Custer never before imagined, and lets us finally contemplate the twisting, uncharted paths to glory and doom. A humorous and tender story of first love, of a boy on the brink of manhood and a nation on the eve of change. It is 1966 and eighteen-year-old Airman Mortensen has gotten into trouble on a U.S. Air Force base in the southwest. He has disobeyed an officer's order and his punishment begins with permanent latrine duty. He spends day after uncertain day cleaning bathrooms while the paperwork for a court martial makes its way slowly through channels. But at the point his life seems darkest, the young airman meets Claire Brill, the base commander's daughter. They fall in love with each other, surrendering completely to the intensity and beauty of first love. Their union triggers a key drama in Airman Mortensen's life, all of it set against the backdrop of Saturday nights dances, surprise inspections, visits from relatives, and the constant search for places to be alone. At its core, Airman Mortensen is about the time in life when purity of heart and rebellion are inextricably mixed. 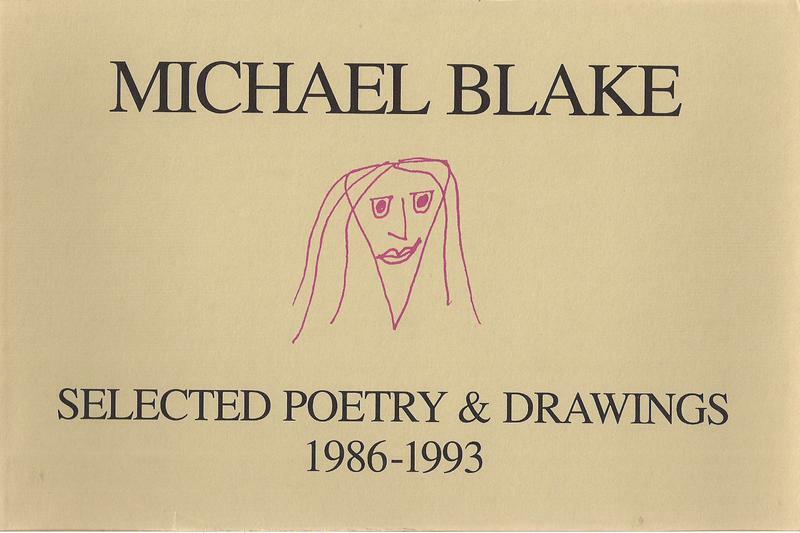 Luminous and precise, Blake's voice captures the restless and indomitable spirit of youth which inhabits us all. Fall of 1970. A thousand-year-cold snap has descended on the Southwest as 24-years-old Michael Blake, in the midst of his senior years at the University of New Mexico, decides to drop out and move to Los Angeles. Accompanied by his dog Kelly and with a phone number for a New Mexico rock band living in L.A., Blake begins his climb to fame. The climb, however, is steep and Blake soon learns that whatever progress he is making is being chipped away by the tedium of everyday survival, unbearable living situations, and rejections. 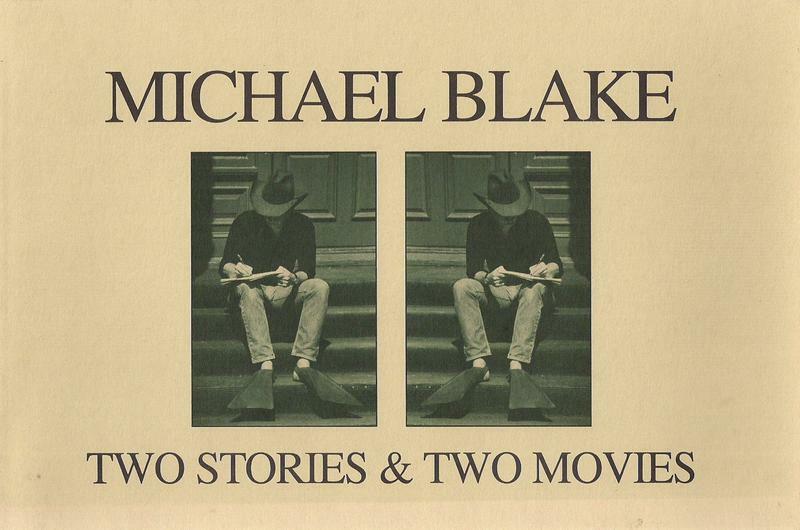 Still, Blake manages to get his foot in at the Los Angeles Free Press and to write his first screenplay. Like A Running Dog is written in the poetic and unpretentious style for which Michael Blake has become known and loved. The autobiography is replete with humorous and melodramatic situations shared by most of his contemporary artistic peers. It recounts an underground scene fueled by ideological beliefs, strong desires to change the world and, on occasion, ego clashes and personal vendettas. A must-read for anybody whose sense of curiosity is intact. Hrymfaxe LLC is a Tucson-based company, publishing part of Michael Blake's work in hard cover format. - the original packing is included. - proof of purchase from Hrymfaxe.com is included. - the return is generated within 3 business days of the receipt of the damaged goods. "It was hard thinking. He had only seen white men on a few occasions, and like Kicking Bird, he could not fathom their behavior. Because of their reputed numbers they would have to be watched and somehow controlled, but until now, they had been nothing beyond a persistent nuisance to the mind. Ten Beard never liked thinking about them. How could any race be so mixed-up? he thought. But he was drifting from the point, and inwardly Ten Bears chastised himself for his messy thinking. What did he really know about the white people? He knew next to nothing... That he had to admit. This strange being at the fort. Perhaps it was a spirit. Perhaps it was a different type of white man. It was possible, Ten Bears, that the being Kicking Bird had seen was the first of a whole new race of people. The old headman sighed to himself as his brain filled to overflowing. There was already so much to do, with the summer hunting. And now this. He could not come to a conclusion. Ten Beard decided to call a council." "That scalp at Wind In His Hair's... no one likes it. But who is to blame? Not Wind In His Hair. Not the Comanches. The Comanches didn't fire first. The white woman had a gun that shoots twice. She shot out Wind In His Hair's eye. He took her scalp and brought it back and hung it in his lodge. That's his right. He's a warrior. Kicking Bird doesn't like it. He doesn't go to Wind In His Hair's home anymore. He wants peace. How can there be peace? If I got up now... I won't get up now, I'm happy on the Kicking Bird doesn't like it. He doesn't go to Wind In His Hair's home anymore. He wants peace. How can there be peace? If I got up now... I won't get up now, I'm happy on the ground. If I were on my feet at this moment, if I looked in the four directions, perhaps I would see them. If I were on my feet at this moment, if I looked in the four directions, perhaps I would see them. No, I wouldn't see them, not here. But they are out there somewhere. They are in the east and the west, in the north and south. They are all around us. They are closer every day. Those hawks circling in the sky... perhaps they are vultures. Maybe they are two vultures trying to decide to come down. If they fly down here I'll close my eyes and lie still. I'll wait while they land, wait until I hear the rustle of their wings coming closer. Then I'll sit up and give them a shock... ha! I can't see them anymore. Must have been hawks. No white person has walked this country either. Oh, I hope they never will. But Wind In His Hair's scalp says they will. What is to be done? A whirlwind might come and carry that scalp beyond the stars. Maybe there is a whirlwind big enough to carry all the white people there too. I have never seen one that big. Maybe there is a song that could be sung, a dance that could be danced. There must be something. The Kiowa always want us to join their sun dance; maybe we should dance with them this summer. They are good people, good friends. But they are too superstitious. How can their ceremonies be trusted? The earth feels warm on my back. I love the earth. Nothing is better. It is soft on my back. My arms and legs are like feathers on the skin of the earth. Am I floating? Am I rising? Am I dreaming now? Am I dying? Does it matter?... What am I doing?" Limited sets available from a private printing of 500. These books have not previously been made available to the public. Uniform size of 9" long by 5 1/2" tall. Pages ranges from 48 to 104. Printed in Arizona on recycled paper. The One, a movie short story from Two Stories & Two Movies has been purchased by Kevin Costner and adapted for the movie screen. 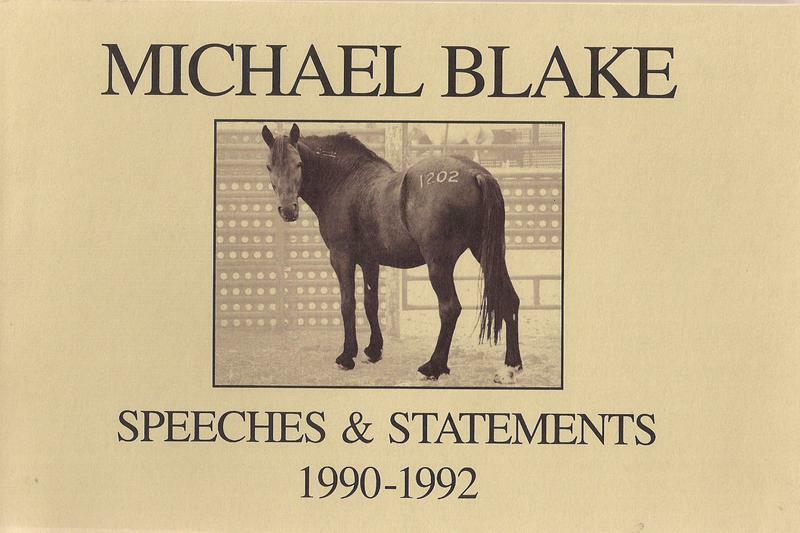 Michael's acceptance speech from the 1991 Academy Awards included in Speeches & Statements.